Blepharoplasty is surgery to remove excess upper and lower eyelid skin which results from injury, aging, or disease. It may be covered by insurance if eye health or vision is affected. Ptosis (upper eyelid drooping) may be congenital or from injury or aging, causing decreased vision and eye fatigue. Surgical repair strengthens the eyelid muscle and removes excess skin. Insurance benefits are usually available when ptosis blocks vision. Ectropion can cause eye burning, watering, redness and blurred vision. It is caused by looseness of the lower eyelid. Surgical correction tightens the eyelid. Entropion results from looseness of the lower eyelid that occurs with aging or scarring. Eyelashes then rub the eye, causing redness, irritation or ulcers. Surgical correction can repair this. An eye examination is the only way to find changes inside your eye caused by diabetes. Our doctors often diagnose and treat serious retinopathy before patients are aware of vision problems. 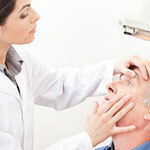 The best treatment is prevention of retinopathy. Good blood sugar control reduces the long-term risk of vision loss from diabetes. Smoking will worsen diabetic retinopathy. Laser surgery and Intraocular injections are helpful in treating diabetic macular edema and proliferative diabetic retinopathy (PDR). For macular edema, both laser and injections decrease fluid leakage. The main goal is to prevent further loss of vision. Blurred vision from macular edema seldom returns to normal, although some experience partial improvement. For PDR, pan-retinal photocoagulation (PRP) shrinks abnormal new vessels and often prevents future growth. It also decreases the risk of vitreous bleeding. Multiple laser treatments and or injections are sometimes necessary. Laser or injections does not cure diabetic retinopathy and do not always prevent further loss of vision. 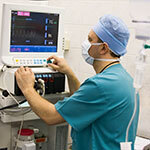 During this procedure, performed in the operating room, the blood-filled vitreous is removed. In women, hormonal changes can decrease tear production The most frequent treatments include artificial tears, omega fatty acid supplements and lid hygiene. For more severe symptoms, ointment or a gel can be used. A new medication, Restasis, is helpful for many patients. Small plugs may be inserted in the corner of the eyelids to slow tear drainage. 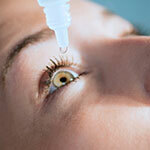 Dry eye cannot be cured, but treatment can make your eyes more comfortable. BOTOX® injections can be used to treat medical conditions such as eyelid and facial muscle spasms. Treatments are done in the office, and typically last 3-4 months. BOTOX® Cosmetic injections are ideal procedures that produce a dramatic decrease of upper facial/forehead lines caused by frowning or squinting. An injection of BOTOX® into the muscles of facial expression weakens the muscles and prevents frowning. For more information about BOTOX® Cosmetic, click here. Routine eye exams are very important to monitor the health of your eye and to determine your need for glasses. Some eye diseases such as glaucoma, can only be detected with a thorough exam, so it is important to have your eyes examined every 1 to 2 years. Your eye exam will take approximately 1/2 to 1 1/2 hours. Your eyes will be dilated, so your near vision may be fuzzy for about 3-4 hours. You will also be sensitive to light, so bring sunglasses with you or we can provide you with some disposable ones. Please bring any prescription glasses with you to your exam. Other tests may be done if deemed necessary. Afterwards, your doctor will explain the findings and make recommendations to help maintain the health of your eyes. We will address any concerns and take time to answer questions. At Jensen Eye Associates, we believe outstanding customer service and personalized care are an essential part of any eye exam. CK (Conductive Keratoplasty) is intended for people over 40 who want to improve their near vision and reduce their dependence on reading glasses. CK is not intended for people with myopia (nearsightedness). Now require reading glasses for near tasks such as reading, hobbies, or computer work. Using radio frequency (RF) energy, NearVision CK changes how the eye focuses light by reshaping the cornea (front surface of the eye). few days, but you are given eye drops to help with comfort and healing. cornea steeper and therefore improves vision.